Here's another quick video of some of our work this Wednesday after Ron Block left. We have footage of Ron, but I have to put it all together, hopefully on the drive to Little Rock, where we're playing tomorrow at a great church. 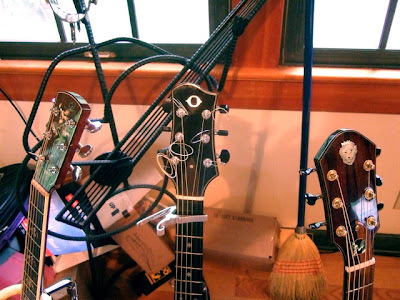 It was fun being at Michael Card's studio with a pile of his fine stringed instruments at our disposal. We decided at the beginning of the day that our assignment was to try and use every instrument in the room on at least one song. We didn't get to the harpsichord or the banjola, but we just might at a later date. I love recording out there, and it's always nice to see Mike, whose mind amazes me. He's an excellent writer and is working on a book on slavery in the New Testament, and crawled out of his writing cave long enough to help us tune the harp and to tell me a bit about the exegetical work he's doing on Philemon. I was fairly amazed and couldn't think of much to say in response except, "Wow. That's amazing." And it is. Today we recorded percussion with Paul Eckberg, and managed to knock out five songs out of eleven. It looks like we'll be booking another day with Paulie. Time to get the kids to bed. I hope to see some of you guys in Little Rock. This week has been a treat. Yesterday we worked with Gary Burnette, a well-known, well-respected, well-digging electric guitar player. You guys who are like me and read liner notes may remember him from Clear to Venus, which we figured out was recorded about seven years ago. I hadn't seen him since. We got a lot of nice electric stuff that you'll see in a video as soon as I can get it posted. Sometime today, I promise. Today we headed back to Mole End. There's something so nice about driving through the Tennessee hills for forty minutes to get there, and once you're there it's so secluded and peaceful I think it's easier to get things done. Part of this is probably also because there wasn't a wireless internet connection; we couldn't check email and take care of other business. We recorded a couple of piano parts that we realized needed fixing, then we had lunch with Sam Judd, a singer songwriter I know through Mr. Card, and the great Ron Block. Just the other night Ron treated Jamie and I to an Alison Krauss and Union Station concert at the Nashville arena. I was so proud to see my friend on stage with one of the finest bands in the world, and it was quite an honor to have him in the studio with us just a few days later. He played banjo on "Rocket" and it was exactly what the doctor ordered. The song had been worrying me a little. Something didn't quite feel right about it and I so badly wanted the banjo to pull it all together. It was so exciting when it did. After that song Ron played bouzouki (which is basically an octave mandolin) on "Hosea", once again providing the meld it needed. Ben also added a bit of Wurlitzer, and the two new layers suddenly made the song sound like John Leventhal (Shawn Colvin), which is about as good a thing as you can hope for on a record. After that we put hurdy gurdy on "All Things New", mandola on "Rocket", and Ben played harp on "Windows in the World". (You read right: Ben played harp.) It was a good day's work, and tomorrow's going to be at least as fun: percussion with Paul Eckberg. Check back later for some video. We just sent out our monthly newsletter (what? You're not on the list? Please be on the list) announcing that we're looking for 20 folks who can carry a tune to sing in a choir for the song "The Good Confession". If you can come to Nashville for a dinner (on me) and an evening of recording, I'd love to show you my appreciation for all your support. When we realized that we wanted a choir to sing on one of the songs, we thought it would be a fun way to include you guys in the making of this album. The first 20 people to email me at singwithap@mac.com are invited to Nashville on the evening of September 4th. We'll send details to the 20. Tomorrow's electric guitar day with Gary Burnette. Ben's getting to the studio bright and early while Gully and I head over to Eric Peters's house to help him move to his new house, which is, literally, across the street. I'm not sure if that means moving will be easier or harder. It'll be farther to walk across the street than it would've been to carry the items into the truck. But then, we won't have to unload the truck so maybe it evens out. Either way, by midmorning we'll be nice and smelly, driving over to Gary's. I wanted to have something up for Monday morning, and this is all I could find. We should have some fun footage this week that'll make up for hearing me sing the same two lines over and over in this clip. We had a fun show tonight in Omaha. We got right to the heart of matters. The audience was great, and we had a chance to play through a few of the new songs during soundcheck and the show. A day full of lice? Ben's producing a record by this duo called Connersvine and had to make a last-minute trip to Indianapolis today to help with some things. That left Gully and I in the studio with a bunch of background vocals to either record or at least flesh out so the guests will know what we want them to sing. But there were problems. Oh, there were problems. Yesterday we finally reached the limit of our patience with the computer/DIGI 001 slowness. The more tracks and plug-ins you're using the more demand is placed on the computer, the drive, and the audio device. At this point in the process that means that every time we press record there's a two or three second pause before it catches up. When you're starting and stopping a zillion times a minute that can tax your happiness. There are other issues too, but you get the idea. Gullahorn's older computer and older DIGI 001 have both been troopers thus far, but their time has now come. This made me giddy. Buying a new computer is rare for me. This morning I picked up a brand-spanking new iMac (not one of the recently unveiled new ones), swung by Osenga's house and read a book to his daughters while he disconnected his 002 downstairs, then sped to Gully's studio to unwrap the new gadget. I know all that stuff about materialism, about things not making you happy and all that, and I really believe it's true. But when you need a tool (and that's all this is) for your job (and that's partly what this is), it might as well be a finely tuned, fine-looking machine (and that's exactly what this is). One of the best things about Mac stuff is the way they package it. When you open the box you're greeted not with styrofoam peanuts and their unearthly squeaking but with a sleek silver-grey box greeting you with a welcome message from Apple, written in the most pleasing font. You slide the machine out of its cradle and it feels like you're an archaeologist pulling treasure from Tut's sarcophagus. Knowing that the thrill will wear off in a matter of minutes only makes me enjoy it more while it lasts. It lasted for about 16 minutes. Then we ran into all kinds of Protools compatibility problems which are too tedious to mention here. I was on hold for 34 minutes before I gave up. Gully and I spent a long time searching their support site before finding what we needed, which cost more money. Then the hardware wasn't working. And Ben, who knows way more than either of us about this stuff, was out of commission in Indy. So we finally got it working in time for a quick, late lunch. Then we pulled up "Hosanna", the song we tracked a few days ago, and realized with a sinking feeling that we tracked it too slow. Sometimes this happens, and when it does, it happens to me. It's a new song so the energy in the studio the other day was high, the guys played it great, and I was so wowed by hearing a band play the song that we misjudged the tempo. At least that's how Gully and I felt today. We both tried playing guitar passes but they plodded along like zombies. We tried new ideas, new ways to play the song to try and raise the energy level, but all was futile. We tinkered with moving the drum parts around and it helped, until finally we tried a tempo shift. Neither of us had ever tried this before, and I'm a baffled that such a thing is possible without changing the pitch of the bass part. (These new-fangled machines!) But it is. We raised the tempo and found the energy we were looking for. Then we realized that it was 6:00. A whole day more or less shot working on a computer that we bought in order to speed things up. That movie from a few weeks ago called "When a Captain is Away" was a pretty good picture of our day, and we closed up shop feeling frustrated. P.S. We have a show in Omaha, somewhere in middle America, on Sunday. 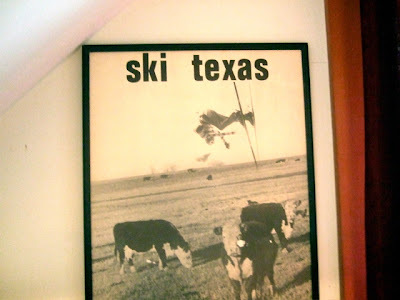 I hope you Nebraskans can make it out--if you do, you might end up on the blog. Then on Tuesday we're recording electric guitars with Gary Burnette (who's GREAT, and who played on Clear to Venus back in 2001). Wednesday we're back at Mole End (Mr. Card's burrow) to record banjo with the great Ron Block, as well as putting to use a hurdy gurdy and maybe some of Mike's other stringed goodies. Then Thursday we're doing nothing but percussion with our pal Paul Eckberg. Next week should be a good and gratifying one, especially after today's liceyness. Well, folks. This isn't a funny one, but it's a look at another day of tracking. Thanks for the kind words about the harebrained scheme. I'm excited about it. Gully's cooking up a fine video starring Ringo and some other special guests, so stay tuned. Andy Hunt and Paul Eckberg are in the control room discussing where to plug in the wiry things, Andy G. is on his way with the hard drives, and Ben and I sit here at the table in the kitchen, plucking away at our computers. Matt Pierson, player of bass, is also on his way. Ringo is safely tucked away in a backpack, awaiting his reanimation among our ranks. Now's as good a time as any to tell you about my harebrained scheme (by the way, I looked it up and it's definitely harebrained) regarding Resurrection Letters. This April I wrote a series of devotional thoughts during Holy Week and someone on the messageboard (Tim Bourne, a.k.a. Sevenmiles) said that they'd been enjoying reading my "resurrection letters." My brain perked up at that phrase, and I immediately thought that it sounded like a good title for an album. 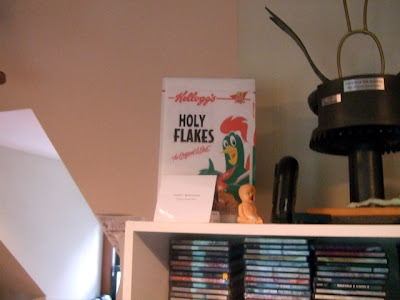 * Knowing that I was preparing for another foray into the studio, I made a list of the potential new album songs and was pretty bummed at first that I couldn't see why an album containing those particular songs would be called Resurrection Letters. They didn't seem to have that much to do with Holy Week. I put the title aside while the Captains and I started playing the new songs at shows, working them out in soundcheck. I started looking for the common thread in the new songs (there's almost always a common thread, however tenuous), and in doing so I realized that RL was a fitting title after all. So many of these songs spoke of rebirth, redemption, new life, the shine of goodness emerging from the rubble of our lives. The title made perfect sense and tied together most of the songs, not to mention the emerging feel of the album. I realized that there was more to say. More than one album could contain. Over the years people have suggested that I record an Easter concept album that would complement Behold the Lamb, something that could be performed during the lenten season to help prepare the heart for Easter worship. My stock response has always been that Behold the Lamb IS an Easter album, if you think about it. Christmas and Easter are celebrating the same thing. Another cycle of songs would be redundant, not to mention possibly seeming opportunistic in light of the success of the Christmas album and tour. Nothing in me wanted to record an album like that. If nothing else, I balked at the challenge of writing a piece of that scope again. Behold the Lamb took years to write, and so many wonderful things aligned to make the record what it is, I doubted it could be repeated. But doubt is a silly excuse not to do something. I feel compelled to create an eight song (from Palm Sunday to Resurrection Sunday) meditation on Holy Week. The two albums will fit together, one being about Christ's passion and resurrection, the other being about what that resurrection means for me and for us two thousand years later. The problem is, I'm recording volume two first. So the tentative title of this album is Resurrection Letters, Volume Two, and the next album will be volume one. I've already started one of the songs and have ideas for a few more, and we're thinking ahead about how to musically tie this record to that one. With the Christmas album, there already existed a canon of carols and a long tradition of Advent concerts so there was a paradigm to challenge, a clear uniqueness of approach to the old story, which was to remind people of the breadth of the historic tale God's telling. In this case, finding a new way to sing about Easter isn't the point--just singing about it is. For some reason Easter week gets overlooked. Sure, there are cantatas, but that's not what I'm talking about. There's no grand holiday break from work and school to herald the event; there's no shopping craze; there's even more potential for the wonder of the celebration to be forgotten, but not because of the Easter Bunny (he's a much less formidable foe than Santa). Maybe it's because Christmas is so G rated, while the Passion forces us to consider the grisly outcome of our sin. Christmas reads like a fairy tale; Holy Week reads like an epic tragedy, bloody and heartbreaking till you reach the last glorious page. I don't know. What I do know is that without the resurrection of Christ, we would have nothing to celebrate. If the son of God couldn't conquer Death, then Death would have the last word and we would tumble into the darkness of grave without a whisper of hope, virgin birth or no. It thrills me to have the opportunity to add to the body of songs about Christ's resurrection, songs for the church that might provide an avenue for worship. When my wife and I were moving into our new house, we pulled up the 17 year-old linoleum flooring and the cat-hair imbued carpet because we knew that it would force us to replace the floors as soon as possible. We didn't have any idea how we'd manage to get new floors, but walking around on plywood and carpet tacks was a great motivation to figure it out. This is me pulling up the linoleum. I've said it, and now either I'll be made a liar or I'll hunker down and find these songs in due time. At first I thought I'd try to write the songs by early next year and record them in time to release the album around Easter, but then I remembered that I have a book to edit and another one to write. It'll probably take a bit longer than that. So there you have it. These new songs, (volume two) deal with the present. They are songs about living in light of Christ's triumph, and about our struggle to do so. Volume one will tell the beginning of the story. The new covenant. The first notes of the New Song. This is music, so as always, things can change. But as of August 22, that's my plan. P.S. I brought Andy G. a pacifier to the studio today, and he finally stopped whining. *Athanasius, the bishop of Alexandria in the fourth century, wrote extensively about the celebration of Easter, and these writings together were called The Resurrection Letters. I don't think ol' 'Nasius will mind. That January day in 2002 when I reported to Andrew's old house on Harbor Lights drive for my first AP rehearsal was the beginning of my proper education as a songwriter. I'd spent all my high school and college years longing for whatever quality it was that made a person write. Now here I was, suddenly thrown in a silver van with Andrew, Eric Peters, and Laura Story--three people who know how to write a song. During that first tour, I read a few books by Annie Dillard, one of them titled "The Writing Life." This amazing manual turned out to be the perfect companion to the paradigm shift I was experiencing in the company of Andrew and his little band of merry men and women ("Footsteps To Glory," if you remember.) Until then, I had always envisioned the act of writing a song as a sort of esoteric experience, never an act of will. Now I was assigned topics to write about and given deadlines to meet. Meanwhile, I pictured Annie Dillard in the little, windowless room where she goes to work each day. I watched as my friends examined and reworked their own work with a certain detachment. There was no line too dear to be cut from a song if it didn't contribute to the whole work. Concurrently, I read that wonderful first chapter of "The Writing Life," in which I was instructed to go at my work as a builder, but with all the tools needed for demolition close at hand, just in case. Needless to say, I continue to attend the Andrew Peterson school of writing jaw-dropping songs. And Andrew is still, in my mind, a writer's writer. Here's an example from this record. Take "The Good Confession," for example. It's a story song that sets the ancient profession of faith (Christ is Lord) against the changing backdrop of Andrew's childhood. I think he's had the chorus for quite a while ("I believe/he is the Christ/son of the living God"). Every writer I know has bits of songs lying around, little scraps of fabric waiting for a quilt. Maybe he formulated the whole concept for the rest of the song when he wrote the chorus or maybe it came came later. Regardless, one of the first things I learned watching Andrew and the other Footsteps is that a good song either begins with a solid concept or it finds one along the way. The fact that I can sum up this song in one sentence is a good sign. Have you ever listened to a novice preacher go on and on for a good forty-five minutes and at the end you had no Earthly idea what he was talking about? It's the same deal. Write all you want, but let there be some strong connecting force that binds it together or nobody is going to follow you. To further illustrate my point, note that each verse of this particular song has its own concept: the first verse being about a boyhood conversion and the second being about an awakening to the gospel after the typical strayings of adolescence. From the day Andrew had fleshed out the lyric of "Good Confession," I think he had the sinking feeling that there was something loose about the song, some ballast to jettison. So we worked the song over in soundchecks and in pre-production, dropping bars out of little instrumental turnarounds to make the next lyric arrive right on time, writing little melodies to make the spaces mean something. "The Good Confession" transformed from a potentially self-indulgent trip down memory lane (that sounds harsher than I mean it) into a pretty streamlined song that I think will resonate with people. And it didn't lose its heart and soul. It's not lightweight, candy pop. It just pops. This is a typical story. I can think of five others like it on this record. I already told you the story of how "All You'll Ever Need" was delivered by cesarean in the eleventh hour. AP cut a whole verse, a good one, out of Don't Give Up On Me so that we can all get to the second chorus a little sooner. On the Slugs & Bugs record, Andrew thought Skye's lullabye just wasn't feeling right, and the remedy turned out to be CUTTING THE CHORUS. This is how it goes. It's work and it's a thrill. And AP's durn good at it, if you hadn't noticed. I have an e-mail in my inbox from Andrew Peterson dated July 8th. The subject heading reads: "You have been invited to contribute to Andrew Peterson's Blog". Now, I have been following this blog and contributing in my own little ways - such as my supporting actor roles in the videos - since it started. I have had good intentions of adding my own thoughts when the time was right. The time just hasn't been right - until now. If you have been following this blog, you will remember a post from about a month ago that was basically a copy of an iChat between Ben and Andrew (notice I was not invited). Posting the actual iChat was a move towards transparency - so you guys can see "behind the scenes" of making this record. To keep up with this level of transparency, I thought it would be a good time to show another form of communication that we use here in the music world. It is called "e-mail". It is like regular mail, but it travels over the inter web faster than an eagle. That is why it is called "e"-mail. Ben. Dear Ben. Dear, dear Ben. I noticed that you posted on the blog--the one you were both invited to post to. Thanks for posting. It's really cool that you'd take even just a few minutes to include your thoughts on the process. I know you have three small kids and a full plate, and yet you find time. Andy. Dear Andy. Dear, dear Andy. Wow. I hadn't read that e-mail until just now. I feel a little weird with it exposed in cyberspace - but I guess it is for the greater good. Perhaps I should explain to you guys and to Slave Driver Peterson why I haven't posted yet by outlining a day in the life of a guitar player co-producing Andrew Peterson's record. 8:05 AM - Get back home. Wake up Jill to feed baby. Clean up breakfast mess. 8:30 AM - Head over to office. Clean up mess from day before. 8:50 AM - Pay bills before they are overdue. Check e-mail. Write a few back. 9:30 AM - Turn on studio computer. Start setting up mics, etc. 10:00 AM - Andrew and Ben arrive. We start "working". 1:00 PM - The best part of the day - lunch. 6:00 PM - Call it a day. Head over to house. Hold baby. Set the table. Wash kid's hands. Help get dinner ready. 7:30 PM - Bathe two older kids. Brush teeth. Put on their PJs. Set out clothes for tomorrow. 7:50 PM - Read a few library books to the kids. 8:15 PM - Start cleaning kitchen, picking up toys and telling kids to get back in bed. 8:45 PM - Sit down on couch with Jill, hold the baby and watch some mindless TV. 9:30 PM - Sit with Jill while she feeds the baby and we talk about all of the happenings of the day and how we feel like zombies. 10:00 PM - Barely make it to bed before falling asleep. 12:00 AM - The next day is the same as the last. I apologize for not finding the time in my empty schedule like Ben "Teacher's Pet" Shive has done. Maybe tonight I will skip the walk with the kids or the 30 minutes I have to hang out with my wife so that I can write about mic placements. If, by chance, I AM able to carve out some free time in my day, it will most likely be spent preparing for the most important event of the year - my fantasy football draft. I really do apologize for not finding the time to contribute my perspective to this blog. I promise I will try harder. We had another welcome Monday off from the studio. While it's nice to have this day job, so to speak, all the other responsibilities that usually take up our time are still waiting for us. The emails and bills and busy work and writing pile up fast, and Mondays off only means Mondays off from the studio. Today I attacked and cleaned the pile of CDs and CDRs that were piled up all around the computer desk. I wrote exactly 19 emails. I walked in the woods behind the house and smoked the pipe my dad gave me, praying for someone dear to me who I just found out has cancer. I jogged for exactly 25 minutes. I renewed the registration on my giant, silver, gas-guzzling, touring van (named "Jill Phillips"). I mailed a copy of the registration along with the fine for the ticket I got last week. I have two interviews tomorrow, so Ben and Andy will be working without me for a few hours. (These will probably be the most inspired and productive few hours of this whole process, mark my words.) Wednesday promises to be an exciting one. We wrote a new song called "Hosanna" that'll probably be the opener for the record, and we need to track it. This is what some of us would call "a pain in the neck". (Those quotation marks take me way back to Chris Farley.) Tracking is "expensive" and "fairly intense". It's "nice" to get it all over with at the beginning of the "process". But when a new "song" comes along that needs "to" be on the album, it's totally worth it, and what makes it even sweeter is that we get to see and work with Paul, Matt, Ringo and Andy Hunt again. "Hot dog". I'm not sure why I'm recounting the details of the days to you fine readers, except that I feel an odd and surprising sense of accountability to you. If you're taking the time to read, to listen to the music, to spend your hard-earned money buying records (and books, soon, I hope), I want you to know I'm not just sitting around. I'm trying my best, and sometimes not trying my best, to be obedient to Jesus, to attend to the work he has for me and the work he is doing in me and, when it's appropriate, sharing that journey with you. There are swaths of my life both shameful and victorious that I choose to keep private; other episodes I am compelled to lay on the table for public scrutiny in the name of light and honesty and encouraging you in the midst of your own either shameful or victorious moments. Resurrection Letters is a part of that encouragement, I hope. It's a record about what it means for us in the year 2007 that Christ rose again and put the nail in Death's coffin. This new song "Hosanna" is my own exclamation of praise, and is at the same time my own cry for salvation, though I'm saved already. P.S. I found THIS PICTURE on one of my readers' blogs, and thought I'd share its hilarity with you. There's not much to say, except that I can't publicly endorse the band Tesla without something of a disclaimer. They had their redeeming qualities: they wrote much better songs than your average hair band from the 90's, songs that dealt partly with Nikola Tesla (the sadly forgotten inventor about whom I know quite a bit), they never wore make up, they were partly responsible for the acoustic rock movement (MTV Unplugged) with their Five Man Acoustical Jam album, and they were the reason for the 8 hour road trip I made to West Palm Beach with my buddy Wade my senior year of high school (1991-92), which is when I bought the shirt. That would make that shirt sixteen years old. It wasn't until a few months later that I found Marc Cohn and Toad the Wet Sprocket, who thankfully ended my exclusive hard rock listening habits. (Rich Mullins, PFR, Susan Ashton and the like came into my life about a year later, around the time I realized how much I loved (and needed) to sing about Jesus.) I like the music I'm making now much better than Tesla, though somewhere in there lurks the influence of everything I listened to, methinks. If you listen close you can hear touches of Dvorak and James Horner, and a little Extreme thrown in for good measure. First, I think it appeals to the part of me that likes orchestration. I'm sort of an arranger at heart, and there's something about doubling a melody that turns that melody into a part. Something intentional and firmly established. A well-placed cog in the machine. Second, I've gotten hooked on the way that timbres change when you double them or mix them together. Imagine the difference between a string quartet and that of a full orchestra. Well, doubling is in the same family of earthly joys, except that the studio enables you to be a mad scientist about it and try it with instruments there wouldn't normally be two of, such your voice. And when you combine two different timbres playing the same melody, it's like you've created a new instrument. I think ever since I heard this song called "Miracle" on a Josh Rouse record, in which they had this simple line being played by a really dorky organ and a really dorky synth and the two things together were MAGICAL together, I've been unable to resist stacking things up to create new sounds. (In fact, not to shamelessly plug, but if you get that David Spencer record that's coming out in a few weeks, listen to this song called "It's gonna be something good" where I'm stacking a music box, chamberlin strings, and a synth for a good portion of the song.) It's an almost culinary art. Flavors in combination. Yummy. Your assignment is to listen for vocal doubles this week. You'll hear them on the choruses of pop songs like crazy. I mean, once you pay attention, you're going to hear vocal doubles on just about everything. Now if you want to hear some more artistic use of vocal doubling (as opposed to doubling for poppy reasons), listen to the Beatles, Elliot Smith, or either of the last two Derek Webb records. Now for recording. May I suggest you start with doubling background vocals? After you've doubled a part try panning both tracks to the same side (far left, for example). Now pan them opposite each other (far left, far right). You'll notice a big difference in how the sounds interact with each other when they're panned together from when they're panned opposite each other. Now record TWO MORE passes of the same part and try panning 2 tracks on each side. By now, you will be in love with this whole deal. Oh, but wait, there's more. Double the lead vocal on the chorus or the bridge. Then try keeping the lead panned dead center and pan the vocal a little to the side and mixed low. Now place them at equal volume and pan them hard left and hard right. Now try doubling either the lead or your BGVs down (or up) an octave. Try doubling the lead vocal down an octave on just one line--maybe a lyric that's supposed to have some weight to it. This is the orchestration part I'm talking about--using timbres to affect the way a melody or even a lyric comes across. Another good place to start is with guitars. By all means, double a rhythm guitar part and pan the two passes far left and far right. By all means double lead parts. And FOR THE LOVE OF PETE, try using different guitars, different effects, and playing melodic doubles an octave up or an octave down. Oh, you're going to have big fun. I ga-ron-tee. I'm giddy just thinking about it. -Rode NTK: A large diaphragm condenser. It's a knock-off of a Neumann U87. -ATK 4033: Another large diaphragm condenser. Famously bitey in the upper mid-range. -Shure SM 57: The classic dynamic mic. I have a theory that people don't use this mic when they should because they've spent too much on the other mics in their collections. -I don't know the model number, but it's a two channel-strip thing by Langevin (a division of Manley). Each channel strip has a pre-amp, an eq section, and compression. -Bad Cat. No idea what model number. It falls somewhere in that Matchless category of really modern, fat and focused sounding amps. -Vox Pathfinder. A tiny little amp that I've heard is a good option. We haven't used it yet, so the jury's out. I just remember hearing that Fleming and John (specifically John) would frequently use small amps because you don't have to push as hard to really drive them and obviously you can make up for the volume difference at the pre-amp. I'm sure there are differences (like the way a room reacts to the sound of a bigger amp) but I'm excited to try out the little amp sooner than later. -Apogee Rosetta 200. It's a clock and an a/d converter. When you record digital audio, your computer can't create a real, honest-to-goodness analog waveform, so instead, it takes oodles of samples to approximate the waveform. Kind of like how Mario's head is made up of a bunch of squares whether you're playing your game cube or the old 8-bit ride (as my brother calls it.) Anyway, as I understand it, Pro-Tools has a built in clock to time out the samples, but it's not a very good one. So it helps to use an external clock, not just for accurate playback but also for good recording. It makes a very subtle difference, but apparantly an important one. The Rosetta also has great audio to digital (a/d) converters in it. Again, better than the ones built in to Pro Tools. This is an expensive piece of equipment, but anybody'll tell you it's worth it, even if my ears are still too untrained to deeply appreciate the difference it makes. -a camera to make funny movies. For starters, let's talk about the pre amp. You probably already know this, but good mics and good pre's are essential for a good sounding record (at least a hi-fi one like this will hopefully be). I know very little about the Langevin, but Gully picked it out with a little help from an engineer that knows way more than me. We've been skipping the EQ section on the pre-amp. I prefer to leave all EQ to my mix engineer, with the occasional exception of really tweaking something out for effect. The mix guy will have better perspective than me, as well as much greater skill at dialing things in. There's not much advantage of EQing to tape when you do it just as well after the fact. We HAVE been using the built-in compression on the Langevin, but only as a limiter, meaning only just enough to keep the signal from clipping when there's an occasional spike. Once again, compression is best left to your mix engineer, even if you're good at it, unless you're going for a really squashed sound. It's all about delayed gratification. You can always listen back through a plug-in compressor and EQ in the meantime to make the vocal sound good when you listen back. But leave permanent EQ/compression to your mix guy. He's smarter than you. For vocals, we've used the NTK. On the far country we used a 57 and loved it (it actually beat the NTK in a shoot-out), but this time we just went for the NTK. Probably because somebody was borrowing my 57 until a couple of days ago. Also because my friend and guru, Josh Davis, chided me for using the 57, since it doesn't capture the highest of high frequencies. But the vocals sounded good. So who's laughing now? Me, baby. Me. Let me pause here to make a note about phasing. I'm relatively new to engineering and my current stop on the learning curve is phasing. Whenever you use two mics (or more) at the same time to capture a sound, the sound you hear ends up being the sum of two (or more) wave forms. If the mics are not placed carefully, the math (it IS math) gets tricky and the waves end up cancelling each other out. If you did it just right you could get them to completely cancel each other, but it's more likely that only certain frequencies will disappear and you'll be left with a hollow sound. The easiest way to avoid phasing is to use only one mic on something. But two mics (or more) come in handy for creating a stereo image of a sound or for capturing a truer likeness of the sound by combining the good characteristics of different microphones. The trick is to learn to place the mics. And I regret to inform you that I'm still learning. 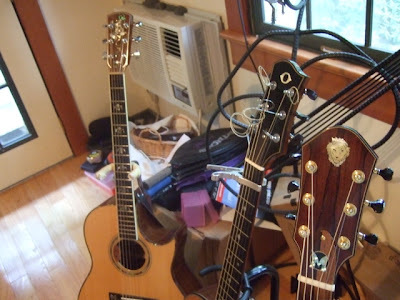 For acoustic guitars, we've used a setup that a friend of ours reccomended to Gully a while back. We placed our 4033 straight up and down with the capsule pointed at the sound hole. The NTK we placed perpendicular to the 4033 and about six inches higher, with the capsules of the two mics aligned. I'm always loathe to record guitars in stereo (with two mics) because of phasing issues and because, the way I've always done it, the sound changes whenever the person moves an inch (this problem is also known as "phasing issues"). But this mic setup has worked well. I do, however, love the sound of a single 57 on acoustics. No phasing issues, for one thing. This 2-condenser mic setup has given us a very pristine sound, which I love. The 57, however has a nice crunch to it and I think we may have to redo a guitar or two on this record just to get that crunchiness. Hosea, for example (even though we're thinking about doing away with the acoustics on that song--shocking, I know) would benefit from a crunchy little rhythm guitar. For electrics, we've placed the amp in the bathroom. We're using both the 57 and the 4033. Again, phasing is an issue whenever you use two mics, but I was recently instructed that for electrics, since you aren't really trying to capture a stereo image--just combining the sounds of the two mics--you can simply place the mics with the capsules as close together as possible. And, in general, I think you want to place them right on the amp and point them near the rim of the speaker. So that's what we're doing. Gully's using a Line 6 delay pedal (the green one that everyone has for good reason) and a Visual Sound Route 66 Overdrive and Compression pedal graciously given to us for pennies by the nice folks at Visual Sound themselves. Between the three of us we're getting pretty good tones. I enjoy searching for guitar tones because I've been using Reason for my keyboard overdubs for a few years and the virtual gear you tweak with in Reason is pretty much just models of real guitar and studio gear. So lately I'm enjoying turning real knobs on a real delay pedal. Okay, that's enough of that. Please excuse any poor grammar or punctuation that might lurk in the above paragraphs. And now I bid you goodnight. The worst is behind us. The tracking, the lead vocals, the acoustic guitar parts--the foundation of the album--have been recorded. Glory be. John asked about tips on doubling a guitar part. I don't know many tips, so this'll be short. The main thing is to know exactly how you play the part, because recording in general, and doubling in specific, is like a magnifying glass on your performance. Sean Watkins once told me that they call the studio the "humilifier", and that's no exaggeration. If Nickel Creek is humilified, then I'm downright repulsified. But it makes you really figure out what you're playing, and why. I remember at the first show Jamie, Gabe and I did after recording Carried Along back in 1999 we were surprised at how good we sounded, and it was because of months of zeroing in on the minutiae of what we're doing in every song. With the doubled guitar part, I put the original guitar in one ear and played along, stopping when something didn't line up (pretty much) exactly. You'd be surprised how easy it is. The nice thing is that with a double you don't have to be quite so picky since it's basically providing an effect--the average listener won't even realize there are two guitars, but it'll sound warmer and intentional. I'm repeating myself. Today was another thing altogether. We finally made it to electric guitars. We're planning on calling our pal Andrew Osenga to play the electrics on a few songs, but Ben and I decided that it was high time Gully started playing some on the road, so most of the songs will be electrified by Gully himself. It was so satisfying to finally hear something to soften the tracks. None of the instruments played so far have any kind of pad effect, nothing to smooth things over and sweeten the feel, so hearing that guitar was like a cool drink of water. "Hosea" is a song we tracked for The Far Country but didn't use on the record. I've liked the song for the last two years, and the theme of redemption in the great Old Testament story fits just right on Resurrection Letters. The electrics sounded so nice that I muted the acoustic strum track and I didn't miss it one bit as we listened through. Well done Gullahorn. Your dream of usurping me has finally come true. The video isn't the most thrilling thing in the world, but you get a good look at how a part is created for a song. I'm taking advantage of a quiet few minutes while the work we did today backs up to a hard drive. I don't know how many of you reading this are from the southeastern portion of the U.S., but if you are, you know the heat of which I will speak. According to www.weather.com, it was supposed to reach a high of 105 degrees in Nashville today. These may be normal temperatures for Hell, or maybe even Nevada, but for this sleepy southern metropolis, they are not. I've lived here ten years and I don't remember a heat wave coming close in temperature or duration. and squats there in the corner grinning at me while I sweat my way through guitar parts and vocals. I believe that once this record is finished the air in the room where the music is being played will actually rise in temperature, and the CD itself may condensate. Another aspect to this oven dilemma is that as the time spent on a song increases, as does the temperature, as does our misery, the guitar strings expand and slip out of tune. Today I was playing Eric Peters's new Taylor 12 string (a fine piece of work, like EP himself) on "All You'll Ever Need" and had to tune the thing probably ten times. Ben just went home after playing me his newest song (and the final piece to his record--I was amazed as usual). Andy took off to take care of his kids. 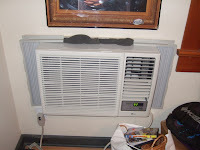 I'm here letting the files backup, reveling in the relative cool of the A/C unit. --Listening to my kids recite Psalm 100 and sing "The Solid Rock", their verse and hymn for the week. --Recording the guitar double for "Windows in the World". Doubling a guitar part, for those of you who care, is playing the exact same part as the original. Usually you pan it to one side and lower the volume a bit, producing the effect of a little bit of warmth and purpose to the first part. It makes the part sound like you meant to play it that way. Forgive me if I already wrote a bit about doubling, as it seems to me now like I have. --Greeting the unsinkable Eric Peters upon his arrival at the studio. --Hanging out for a few minutes with Will Sayles, drummer extraordinaire. He showed up at the studio as I was explaining the conspiracy theories about 9/11 to the Captains. I wasn't endorsing these theories; just recounting the crazy things I recently heard. I'm afraid Will now thinks that I'm an imbecile. A paranoid imbecile. --A great lunch at the Copper Kettle, where we bumped into Goodgame and one of the pastors at my church. --A fruitless search for a Vox Pathfinder guitar amp for Gully to use on the record. If anyone has one for sale, we're all ears. --Seeing a guy with incredible 80's hair at one of the music stores. --Recording 12 string geetar on "Hosea". --Singing the vocals on "Hosea" and "Invisible God". --Driving home from the studio listening to Jackson Browne, wishing I had half the singing voice he has. We opted to fly into Gainesville, 30 minutes from Ocala, which would be close enough to my hometown to have dinner with my folks. The plane was supposed to have arrived at 5:30, and we'd get to Shiloh right around dinner time to enjoy my dad's legendary steaks. Every plane we rode on this weekend (a total of four) was late. We got to my parents' house at 9:30, which was in time to eat the scrumptiousness but too late to play a game of horseshoes. We could've driven from Tennessee to Florida in the same amount of time it took to fly there, what with all the delays. That's what I get for flying into a dinky airport, I suppose. Part of the gig involved playing for fifteen minutes before the service started. People were filing in and visiting with one another, which took a little of the pressure off, so we played a few new songs: "Invisible God" and, for the first time ever, "All Things New." After some great mexican food for lunch, we headed back to the airport to find that our flights were once again delayed. This isn't an inconvenience to us as much as it is to our wives--as soon as it's clear that we'll be getting home much later than we thought, the Captains and I whip out the phones and deliver the bad news to our kid-weary wives. What we husbands do is definitely hard work, but it's a kind of work that doesn't involve being responsible at all times for three needy children. I don't know how Jamie does it. Oh! For those of you who pre-ordered Appendix M, it's in. We got them Friday, and we're having a little envelope-stuffing party tomorrow night. Look for them in the mail this week. Here's a quick movie detailing a few of the events of Friday's recording session. My friend Michael Card has a nice little studio at his house in Franklin, and we took him up on his offer to record there. He has a nice Baldwin piano, and we have a nice balding piano player. It was meant to be. We recorded piano part after piano part with a nice break in the middle when Mike came by and rode with us to a place in Leiper's Fork called The Backyard Café. Mike's been kind to me over the last couple of years, recording "The Silence of God" on his latest album, letting me hop on the bus with him and his troupe and open for his gracious audiences. I've learned a lot in the relatively short time I've been around him. When we got back from that glorious lunch we met a musician named Jeff Taylor, with whom I've corresponded a bit via email. He's one of those guys who can play about every instrument you could throw at him, and who rubs elbows with all manner of great musicians. He ended up pulling out a couple of accordions and played us some Irish tunes--I'm pretty sure Mike said that he'd played a bit with the Chieftains, which makes him cooler than I'll ever be. I'm hoping he'll play a bit on this record. We got back to work and recorded straight until about six. Ben's a really great piano player, in case you haven't noticed. It was so nice finally hearing his addition to all these guitars and vocals we've been recording. We also had time to do a little reminiscing as you can see below. We're off to Ocala, Florida to play at First Baptist Sunday morning; FB of Ocala has been very kind to me over the years, so it'll be nice to see some familiar faces. We'll also get to pay a short visit to my folks' place, Shiloh, where we'll eat fatteningly good food and hopefully play a game of horseshoes with my dad. Exciting times, these. We loaded the kids up in the car today and drove to Franklin. What was happening in Franklin that would make us so giddy? Was it because we were meeting the Goodgames at a mexican restaurant? Nay, it was not. It was because we were driving to Big Idea, the place where VeggieTales is made. We haven't been too vocal about this because of the possibility of it falling through, but after today, I'm not holding back. After hearing Slugs & Bugs & Lullabies, some very kind guys producing the next VeggieTales video asked Randall and I if we'd like a shot at writing a Silly Song. That's right: capital S, captial S. We of course jumped at the chance and spent several days brainstorming. We came up with a song called "Monkey", and made a demo in which I did my best Larry the Cucumber and Randy did his best Bob the Tomato. We played it for the producers (we were sweating like hogs, by the way) and they really liked it. Fast-forward a few months, and today we marched our kids past all the Veggie posters, the concept sketches for the new feature film, and into a little theater where we watched The Wizard of Ha's with about twenty Big Idea employees. What a thrill it was to be a small part of the team that puts these movies together. I don't think I ever realized how much work and love is poured into these videos by these men and women, and I'm always impressed with how focused they are on their mission, which is basically to communicate God's love through creative media. I can't tell you how surreal it was to see Bob and Larry acting out a scenario that Randy and I created, singing a song that we wrote. The best part, though, was that the final scene uses "You Can Always Come Home", from Slugs & Bugs. The video is great, with or without our songs, and I can't wait for you guys to see it. I think they said it releases in October. I hope I don't get in any weird trouble for giving you the details in a public forum, but I was just so excited I had to say something. It was a great memory for the Petersons and Goodgames. After a celebratory visit to Baskin Robbins, I was dropped off at the studio where Ben and Andy had been working most of the day on some of Andy's guitars. I sang "The Good Confession" and we packed up and called it a day. Tomorrow should be a fun day, too. We're heading down to Michael Card's place, Mole End, to record Ben's piano. Adding his purty playing to these songs is going to be uber-gratifying, I think. Gullahorn and Ben were both out of commission for the last two days, so no recording happened. I did, however, comp the vocals for "Windows in the World" and "All You'll Ever Need", from the comfort of my own home. There's this little device called an Mbox that was one of the most justifiable musical purchases I've ever made. It cost me $400 about five years ago (I think), and allows ProTools to run on my iMac. All you really need is a microphone and/or a guitar cable and you can record and edit whatever you can think up. The possibilities are endless, and the excuses are eliminated. When I was a kid, I saved for months to buy a TASCAM four track recorder. I remember buying it used from this music store in Gainesville with money I had made stocking shelves at the local grocer. Finally I had the means to record everything that was bumping around in my head. Those first weeks I spent in musical gloryland, reading the manual and learning the subtleties of multi-track recording, playing "Every Rose Has Its Thorn" and Skynyrd's "Simple Man", then trying to sing them, making tapes to force upon my friends on the drive to and from school. My senior year, my buddy Wade's grandpa died and left him an old single-wide trailer out in a field. Wade managed to talk his dad into letting him stay out there some of the time, and we turned that old trailer into a studio and rehearsal space for our non-band. It could not, in the furthest reaches of your imagination, have been more redneck than it was. 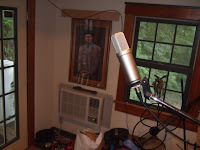 It was sweltering, dead roaches lay about on their backs, the weeds were waist high and crept up on the perimeter of the trailer like confederate soldiers, and my trusty TASCAM sat on a water stained bureau in the corner, daring me to make good music with it. I did not. I most certainly did not. I would drive straight to Wade's trailer after school and goof around with his electric guitar, my acoustic, the bass that we hijacked from Trey, studiously avoiding whatever homework I was supposed to be doing and mumbling to myself quite often about how much fun I was having. My crowning achievement, my grand experiment, was learning all the parts to the Garth Brooks song "The Dance" and recording them on the TASCAM. I played the drums (which beggars belief), the bass, the pretty, sad piano part, the acoustic guitar. And then, to my embarrassment even as I was doing it, I sang it: "The-uh-uh-uh-uh dayance..." I have often wondered what happened to that tape, and have in equal parts wished I could find it and hoped that it is forever lost. When I think about that kid I was in high school, I imagine how blown my mind would've been to have had the nearly limitless possibilities of ProTools at my fingertips. I would never have slept. I think about that old TASCAM almost every time I work with my little Mbox and my computer, and marvel that some fifteen years later I'm still tinkering around with tracks and sounds and songs, though I'm thankfully beyond covering Garth (that song is still a guilty pleasure of mine). The only bad thing about those limitless possibilities is that, as I said, I'm out of excuses. In the old days I'd complain that if only I had more tracks or better equipment, then I'd make some music. Now I have the cool, simple little program, and I seldom do anything with it. Sure, it comes in handy when I'm making a record, because I can bring the hard drive home, plug it in, and edit away. But the rest of the time, the Mbox gathers dust. I'm not a multi-track recording genius. I'm not oozing with musical ideas the way I might've thought I was when I lacked the means of expressing them. Music comes either after much struggle or like the crack of a whip, and it comes without all the bells and whistles of computer programs or nice guitars. You're sitting at the piano and the Idea descends. The Idea doesn't trouble itself with what you don't have, but what you do. The tools at hand are part of the final form, however much it changes between the points of creation and completion. When I was in high school, I loved the TASCAM. I am now more thrilled at the thought of an empty page in my composition book, or a quiet night while the family sleeps during which the creation process embraces me rather than spurns. First I find the song, or the song allows itself to be found, then months--sometimes years--later, I blow the dust from the Mbox and give the song as much love as possible, to give it a fighting chance to be loved by those who will hear it. Tomorrow we're starting up at Gully's house again, and I can't wait. Tonight was a private house show for some great supporters in Alabama. Gullahorn is out of town and the indomitable Eric Peters just got back from working a Young Life camp in Minnesota, so we asked him to come along. After a great meal of kebabs and veggies and rice I headed downstairs for a few minutes alone before the show. I started a new song last night (a contender for the record) and squeezed in a few minutes to work on it. Eric and Ben meandered downstairs after they finished eating; we talked and prayed for a bit before the hosts and their guests came down for the concert. I always love house concerts. Financially it's not feasible to do them too often, but when we can fit one in for some great folks like we did tonight, it's a huge blessing. There's more space for stories, more camaraderie between the audience and the players. When I left the house tonight I felt like I had encountered the Church at its best. Laughter, feasting, the telling of the good news, service: the unique sensation of interacting with the body of Christ on earth. I sang several songs from the new record and they were (to my great relief) well-received. I had the chance to talk a little about the concept behind Resurrection Letters (something I'll post about when the time is right). It was also great to hear Eric play again. It's been too long since I've watched his maddeningly good guitar parts, heard him sing, felt the excitement of watching people experience his music and his quirky, Pappy-fied self for the first time. We played WePod on the way home, which whiled away the miles--the highlight of the game was hearing an Imogen Heap song I had never heard--if I haven't told you guys about WePod, I will later. It's 2:34 am and I'm fading fast. Thanks to the Wootens and the gang for bringing us in and blessing us so much. I told you a few posts ago that we had a special visit to the studio last week. We don't have any video of it this time, but with Andy G. gone, Ben and I were out of steam. We had that long day yesterday, and for some reason couldn't muster the emotional energy we needed to do good work. After singing a verse of "Invisible God" I knew my voice wasn't sounding good and we cut it short. Then we recorded my acoustic guitar part (which is a very basic strum part, so that we can leave room for the other instrumentation) for "The Good Confession". All morning we were watching the clock, wishing it was time for lunch. When lunch finally came we zipped out of there like the place was on fire and met Paul Eckberg and Goodgame at a local mexican joint. I don't know if it was the beans or the enchiladas, but when we got back to the studio we were just done recording. Goodgame played us a new song of his that I'm considering for this record, I played them a few ideas for a new song too. I'm not convinced that all the songs are written for this album, and I have a slow start to one that may turn into something usable. Anyway, we threw in the towel early today. I came home just in time to ride with Jamie to a local park where the ranger was teaching about how to grow a butterfly garden. We learned about milkweed and monarchs and parsley--actually Jamie was the one paying attention. I was reading a Wendell Berry book. It was so nice just sitting still and letting my mind ease into something non-musical for a while. We have a show in Alabama on Monday (at which we'll be joined by Eric Peters) and we'll hope that come Tuesday the energy level is back to normal. Today was one of the more brain-intensive days in the studio yet, both for Ben and for me. Ben's brother-in-law tagged along for the morning and observed from the futon while I recorded the acoustic guitars for "All You'll Ever Need" and "Windows in the World". When I say that it took hours and hours to get the guitar parts (that I wrote) right for just two songs, I'm not exaggerating. We got to the studio at about ten, and with Gully out of town there was less tomfoolery, so we cranked right up with the guitars. People usually overestimate the sound of a nice guitar. After you reach a certain level of quality with a guitar, the rest is subjective; the main difference between this fancy one and that fancy one is preference, or the number of bells and whistles. If you love an instrument well, it tends to sound better to you. You come to love it for its scratches and dents and quirks, and the actual sound of it is of equal importance to the history you share. So between the four or five guitars sitting in the studio, I tried out the Olsen for "All You'll Ever Need". I had played one years ago (it belongs to my friend Danny Oertli) and the strings on it were pretty old at the time. I wasn't impressed with the sound, though knowing that James Taylor and Phil Keaggy (I think) both play Olsens, my expectations were high. It confirmed my suspicion that once you reach a certain level of instrument, they can't really sound that much nicer--not five-thousand bucks nicer, anyway. Well, today challenged that opinion. It didn't change it, but the opposition scored a point. That Olsen felt so nice; the intonation was just right, the sound of the high strings was especially bright, and in the words of Nigel Tufnel, "Just listen to the sustain. You could go out and have a bite--still be hearing that one." Anyway, it was a surprise. Then came two hours of playing a 3 minute song over and over and over and over and over again until it was right. Poor Ben at the helm steered us through some treacherous waters, and by the time lunchtime arrived it felt as if we'd just carved a path through the teeth of the Arctic Sea. That made Baja Burrito taste especially good. The illustrious Paul Eckberg joined us for lunch and brought along our old pal Ringo. After lunch Ben and I started on "Windows in the World". This is probably the most fingerpick-intensive song on the record, like "Queen of Iowa" or "All Shall Be Well" on The Far Country. I went into it prepared for labor. We worked for a good hour or so until a storm rolled in. We could hear the rain and thunder through the microphones, not to mention the planes overhead and the occasional train whistle blast. All these sounds strangely converged at about the same time so we spent a sweet twenty minutes or so waiting for the storm to pass, listening to a different music altogether. Goodgame and Osenga stopped by the studio for a few minutes to pick something up, but sadly we didn't get to hang because the song was waiting for us. We worked on those guitars until 5 o'clock today, and our brains were fried. Oh, and I didn't mention that we recorded my vocals for the two songs today too. It was a good day's work. Here are a few more pictures from Gully's studio, meant to inspire. So after posting all these ridiculous videos, I've been paranoid that you guys think that all we're doing is goofing around. The answer is, it's not all we're doing. There's a fair bit of laughter (more, in fact, during this record than any other one besides Slugs and Bugs with Goodgame), but it's usually the psychological release after several hours of intense concentration. Or, several minutes. Or seconds. My first record was a sort of nightmare, in some ways. Gabe Scott and I were nervous, starstruck by the players we were working with, mere babes in the woods, and the studio cats were seasoned, tough-skinned, and a little cocky in some instances. It was crushing to Gabe and I to be made to feel so untalented and uncool by comparison during the making of our own record. The engineer, an amazing guy named Gary Paczosa, kept assuring us, "It's not supposed to be like this." Good ol' Ken Lewis was another voice of reason amidst the tension. We survived, and the record turned out better than I would've dreamed, lousy studio vibe or no. With Clear to Venus the vibe got even better, though I was still so green and nerve-wracked. Love and Thunder was the first record I made after my pal Gabe Scott moved on to other things, and I had just started traveling with the indibnible Ben Shive who was even greener than I was at the time. It was the first record of songs that hadn't much been played live, all the guitar parts tried and true, with Gabe. But Steve Hindalong and Derri Daugherty were gentle souls to work with, and they nurtured those songs into a record that once again turned out to be far better than I would've hoped, thanks also to Ben's great contribution. It was such a relief when Gabe called to say (jokingly) that he was a little bummed that his favorite record of mine was the one he played the least on. I remember that record being made in the bitter cold of winter, and it mirrored some parts of my heart at the time. There was a somber sense of purpose and care with that one, and I think you can hear it when you listen. Then came Behold the Lamb, which was produced by Ben and Andrew Osenga. We were all three young guys (I was the oldest, which was weird), making a more complex, grand record than we'd yet made, and there was a lot of learning happening. The three of us made a few mistakes production-wise that we grew from, and had a great time making that album with the greater community of Square Pegs (though we didn't know it yet). I remember it being another great experience in the studio, though it took a lot of work and since I had just been dropped from the label the finances were frightening at times. The Far Country sounds to me like Ben and I finally hit our stride. Ben had produced several more projects in the meantime and I had a clear sense of what I wanted the songs to sound like. Gullahorn had just started traveling with us and his guitar parts were well thought-out and were written into many of the songs from their inception. Osenga had also traveled with us a fair bit and was familiar with the songs and the sound that I wanted. The kids' record with Goodgame was a singular experience. We produced it ourselves, recorded the whole thing in days, laughed until we cried at the silliness of what we were doing, and ended up with a project we're both proud of. It's hard to compare the rest of these records with that one, mainly because the pressure was off. I got to experience the goofy fun of music probably for the first time since leading songs at church camp fifteen years ago. Somewhere along the road I changed from the skinny kid who was horrified to speak his mind in the studio to the less-skinny man who learned, with much help from his compadres, to bring an album into the world. That doesn't mean I'm a producer. Ben's a producer. The guy's full of ideas, and they're usually great. He knows music, knows his gifting, and is invaluable in the studio. Gullahorn is a great player with a musical sensiblity that I'm amazed by. They both hear things that I'm oblivious to, usually having to do with the minutiae of timing, and they can talk about musical ideas and execute them within minutes. I'm the guy that writes (or co-writes) the songs. That doesn't call for much in the studio other than playing my guitar parts, singing the songs, and engineering when I can. What's so delightful about making this record is that there's little question what our roles are. We've done this before. It's not a well-oiled machine, exactly, but at least it runs. It gives us the freedom to make the record without the stress of worrying about hurting one another's feelings, without wasting time with pretense. We've been traveling together for years now, and our musical tastes, though not always the same (Ben likes Wilco, Gully grew up on country), complement one another. On top of all that, we're Christians. We all believe what these songs are saying, believe that God gave music a particular power that can bear his truth right down into the deeps of the heart, where resurrection begins. All the laughter is born out of that common joy that comes from the work of your hands building up the Kingdom. It's also because guys, when they're in a studio together for weeks at a time, act like buffoons. Yesterday we were, as we said, Ben-less. I felt a little out of it, probably because of the long weekend (a weekend that included seven planes, two shows, three late nights and two early morning flights). I played my guitar part for Love is a Good Thing and felt terrible about it. Everything seemed out of time and out of tune, but I finally made it through with Gully at the controls. Then he played his guitar part and I struggled to pay attention through the grogginess. We took a break for lunch and when we got back I tried singing a few passes of the vocal on the same song, but it just wasn't happening. So today, first thing, we listened back to what we'd recorded Monday and found to our surprise that it was just fine, once again proving true the old saying, "When you feel crummy your guitars and vocals also seem crummy, though they may not be." Then we started working on All Things New, and after a glorious lunch at Hot Diggity Dogs with some buddies (who included the infamous Eric Peters, just back from his summer at Young Life camp), set back in working on the vocals. I felt way better today than yesterday and we were able to get not one but three vocals sung and comped. (Love is a Good Thing, All Things New, and Rocket). We had a few special guests at the studio again today, and we'll get those edited for your viewing pleasure as soon as we can.